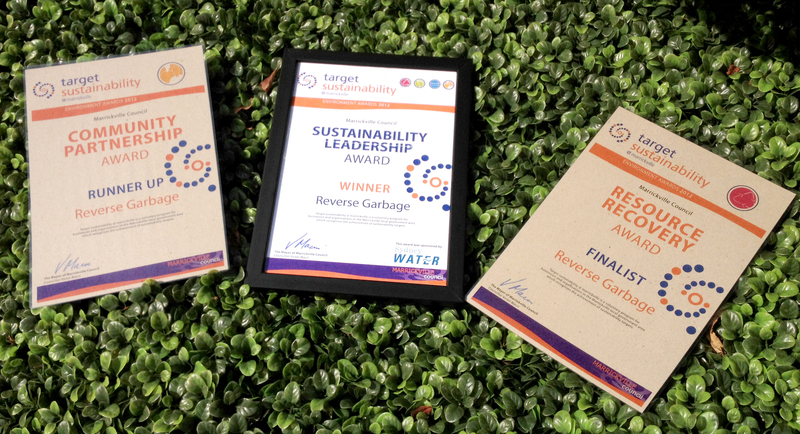 Reverse Garbage, Australia’s largest not-for-profit creative reuse centre, was joint Winner of the Sustainability Leadership Award at Marrickville Council’s Target Sustainability Environment Awards held 28 November 2012. The awards recorgnise and celebrate sustainability achievements by local business and individuals in the local community. Reverse Garbage was recognised and congratulated for decades of hardwork in diverting valuable resources from landfill and promoting reuse, sustainability and waste reduction to schools, business, industry and government. Reverse Garbage was also ‘Runner Up’ in the Community Partnership Award and ‘Finalist’ in the Resource Recovery Award.